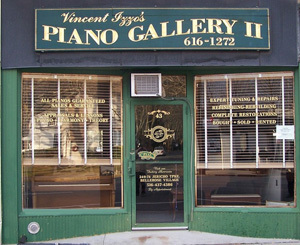 Vincent Izzo's Piano Gallery is a business dedicated to the pursuit of perfection in all things related to pianos. 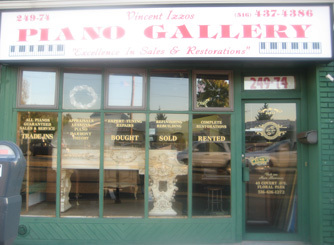 The owner, Vincent Izzo leads a life dedicated to music and pianos and is a concert pianist. Vincent majored in music and minored in education at Queens College. He studied under master professors from the Moscow Conservatory, Julliard and the Dorothy Taubman Institute. Early on, he realized that his love of the piano extended beyond the classical and jazz repertory. He sought to learn everything possible about the inner workings and construction of pianos, what made the best of them so great and what made others so mediocre. As a Master Pianist, Piano Technician Guild Member, Piano Teacher, Piano Tuner, Vintage Piano Restorer, Rebuilder and Refinisher, Vincent built his entire life around the piano . Vincent started his piano business with no financial backing, very modest means and a lot of talent. Using his highly developed musical ability, he tunes pianos using his own natural hearing. When he is done tuning a piano, It is tuned to the highest caliber, worthy of a concert pianist. He should know, because he is one! He is also a perfectionist. For over thirty years, he has been perfecting his craft and honing his skills, so as to unlock the full potential in every instrument he works on. He is a master craftsman, a Registered Piano Technician with the Piano Technician's Guild and a consummate perfectionist. He strives to share his love of music and pianos and for many years, has been teaching the young and old alike to perform works of the great masters. 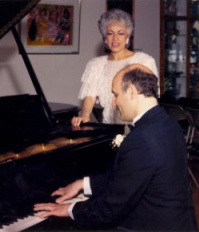 Vincent stresses the correct technique in his teachings, so that a properly trained student will have the ability to play any style of music correctly and without injury, which is so often experienced by improperly trained pianists. Vincent's ever-growing business now boasts three locations; two showrooms and a factory. Please call (516)616-1272 to arrange an appointment to view the large inventory available. You get what you pay for. Vinny doesn't wear a wristwatch, has uncompromising integrity, guarantees his work and, since he plays professionally (also pieces for left hand only) he "knows" . . . he has that sixth sense. One of our clients purchasing our $125,000 six foot 110 year old totally remanufactured Steinway went shopping to a popular Long Island outlet and mentioned Vincent Izzo. The reply "Oh him! No piano can please him. He's a perfectionist." To this client who is a lawyer and a musician with a very discerning ear, that was the best recommendation. As a piano teacher he is brilliant. I, his wife witness his lessons. Vincent also majored in Psychology. He knows how to break down mental blocks, and instills passion and 100% attention, concentration and encouragement into every lesson. His students range in age from seven to seventy seven. He is a concert tuner. He will tune any piano and maximize it. A typical response "My piano never sounded better". When I was a child, I always loved the piano. Since my family was of somewhat modest means, piano lessons were certainly not even considered. Nevertheless, I would pretend to be playing the piano on a piece of furniture in the dining room which was referred to a buffet. Some 37 years later, while attending a self-actualization seminar, I mentioned to a complete stranger that one of the things I had always wanted to do was to play the piano. When I told him that I didn't own a piano, he pulled out a spiral-bound notebook from his briefcase and started to write the name, address and telephone number of a certain Vincent Izzo. He added that Vincent had "tremendous integrity." I thanked him, folded the sheet and placed it in my wallet...where it remained...for 5 years. I had been in the insurance and investment field. It was 1985. I had been divorced and had had several romances-none of which worked out. I had given up on relationships. I was depressed and not feeling very healthy. During that time, one of my clients purchased a sizable life insurance policy for his estate from me, which provided me with some unexpected income! I knew that I had to do something to shake myself from my depression. By that time I had moved the sheet with the piano man's name into a special wooden box. I retrieved it, dialed the number and waited...He was there,seemingly waiting for my call. "Hi, I said, "My name is Roseann..I've been carrying your name around with me for five years and I am going to buy a piano from you." I knew nothing about pianos but I just knew that this was the thing to do. When Vinny came over to my apartment to tune the piano, well,basically, he never left. 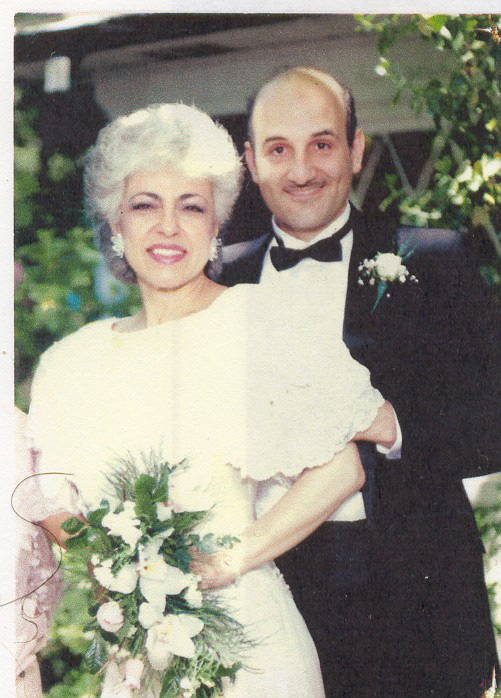 We were married on May 28th, 1989. I have since invested in him and his piano business, essentially with the profits from my insurance business. Now I continue to work on behalf of my clients, helping them with their overall financial security while I watch my 'Piano Man' and our business blossom. To keep myself balanced, I practice Shiatsu (Japanese Massage Therapy) and engage in Competition Ballroom Dancing.